Microscope arranged with the condenser for viewing transparent objects. Microscope arranged with the Lieberkuhn and stage forceps for viewing opaque objects. 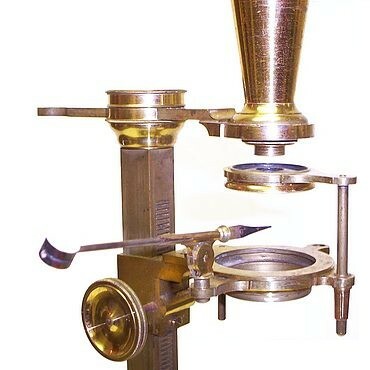 microscope using the Lieberkuhn objective with the stage forceps. 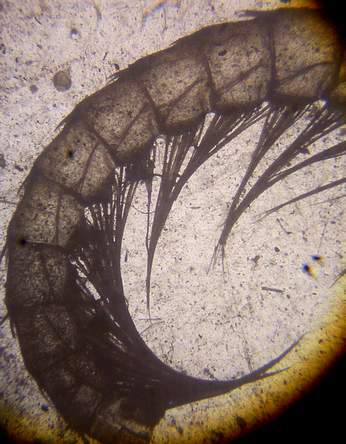 A view through the microscope of a preparation between mica disks on the ivory slider. 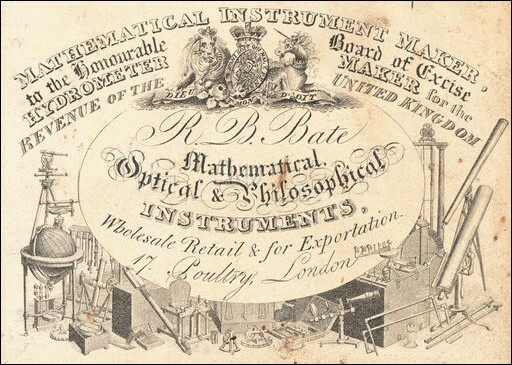 Elsewhere on this website are examples of a small Jones Most Improved and a large Jones Most Improved microscope by Bate. 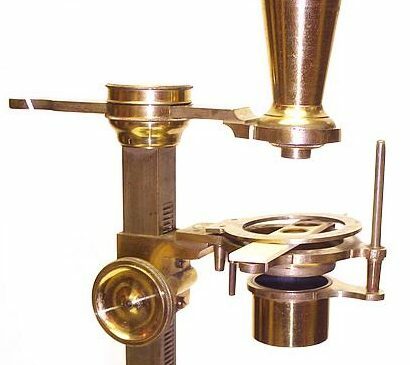 The microscope now known as the "Jones Improved" model has its origin in the a microscope introduced by George Adams Jr. in the late 18th century and described in his 1787 publication, Essays on the Microscope. By the end of the century, the copyright to Adams' books and designs were purchased by the firm W. & S. Jones of London. 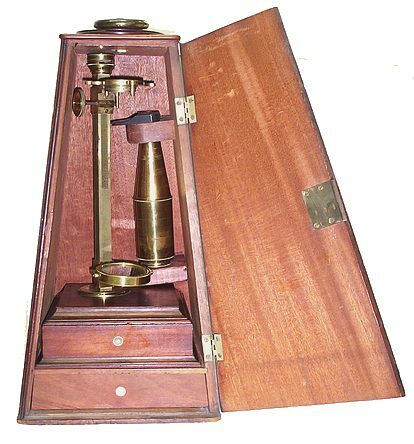 They began, in 1798, the production of a microscope with a similar design, which they called the "Jones Improved Microscope". 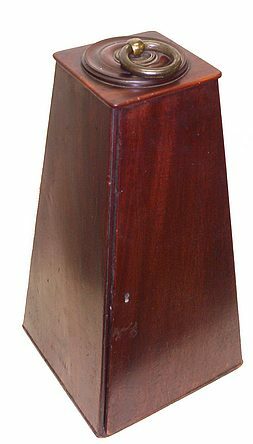 A rectangular pillar which is usually mounted on a box with a draw characterizes this design. 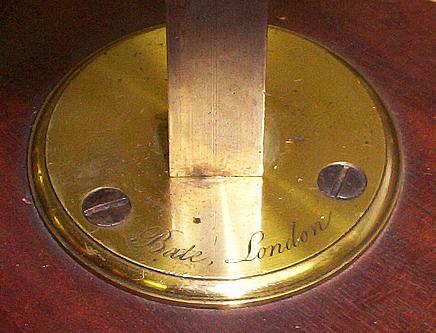 Mounted on the top of pillar is a bar that holds the tube, while on the pillar is mounted the stage and the mirror. The focusing mechanism consists of a rack embedded in the pillar an pinion attached to the stage; this arrangement moves the stage in and out of focus. The mirror can also be positioned on the pillar by sliding it up and down. The optics in this model usually consist of a double eye-lens and a field lens located within the body of the tube; the objectives are non-achromatic. This design became very popular and was produced by many other English opticians during the first part of the 19th century. 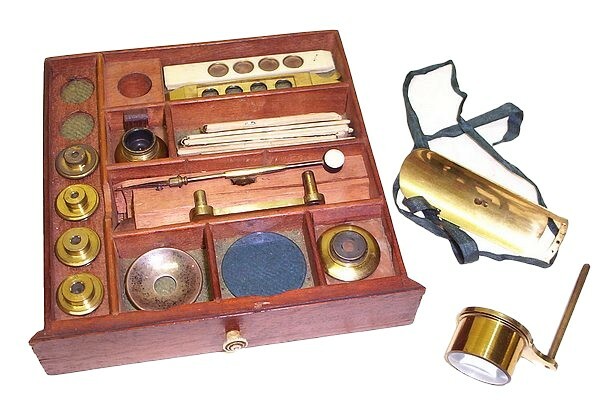 It was supplied with a variety of accessories as illustrated in the image at the right taken from the Adams book.